Before two friends and I drove off to spend three day in Los Angeles, I went to the LA Times website to search for places to eat. Two five-star places stood out as good and affordable places to eat. The first one we tried, Ammo Cafe, provided us with a comfortable and pleasing setting and good but unexciting food (ok, the grilled hen and the pork chop were a little dry, but other than that a good meal). 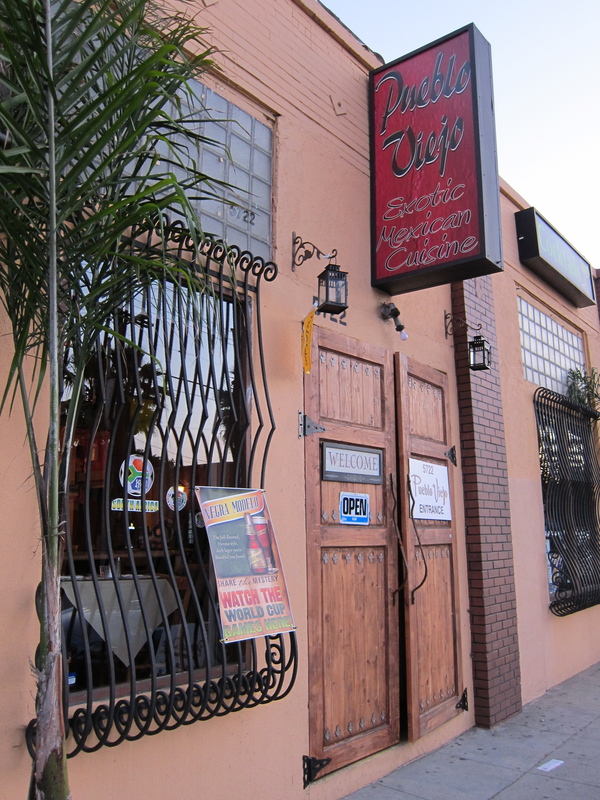 The other five-star place I found online was Pueblo Viejo, described by the LA Times reviewer as very good traditional Mexican cooking. Its location suited us perfectly. We wouldn’t have to go far east to find good Mexican food. Around 7 pm, we drove hoping we’d get in. When we got there, we had no trouble parking. We entered the dark dining room with a bar lit from behind. No diners in sight. Bad omen. But we stayed. The three of us were very glad we stayed. Just as you may know a man by the company he keeps, so, too, you may know a Mexican restaurant by the chips and salsa that they serve. Warm, fresh chips came to the table. Good red salsa. Good margaritas. We noticed fish on the menu, pipián, cochinita pibil, and several other dishes both traditional and less so. I ordered one chile relleno and a fish taco. One friend ordered chile verde and the other ordered a chile relleno and an enchilada. We all agreed that the flavors of everything we ate were distinctive and robust. The cheese-and-rice-filled chile relleno was topped by an amount of cheese just right to contribute something to every forkful. Our plates were notable for a complete absence of oil. Cumin seemed to be the dominant spice, which pleased us all. The beans were firm and salted. Why, we asked, wasn’t there anyone else in the restaurant? Does a five-start review count for so little in LA? Our server explained that most of their customers come from Paramount Studios, just down the street. When the studio closes up over the summer, the customers disappear. Every summer, the restaurant fights for survival until September, when productions start up again. So, if you’re looking for good Mexican food in Los Angeles, especially during the summer months, help a good restaurant out. Go have an excellent, inexpensive meal at Pueblo Viejo.